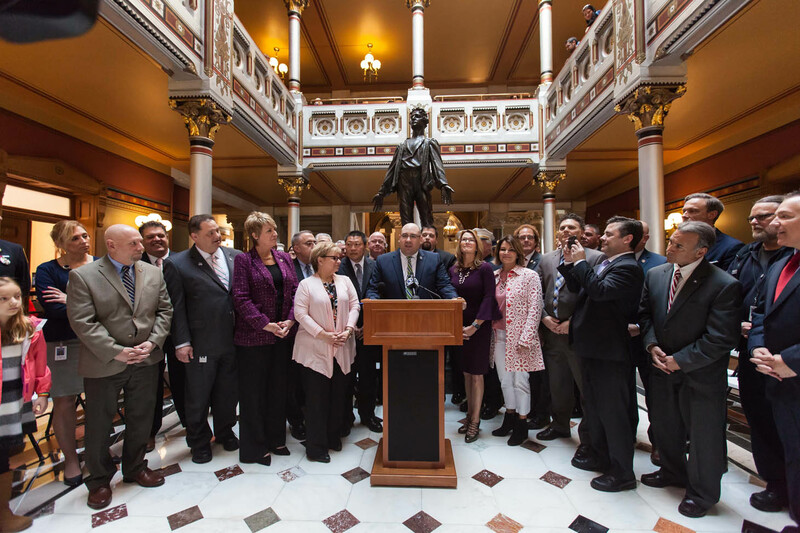 I joined Co-Chairs of the bi-partisan Fire and EMS Caucus, Representative Brian Ohler, and members of the Connecticut State Firefighter’s Association and Fire Chiefs from around the State to host Fire Service Day at the Capitol. Rep. Ohler and I founded the Fire and EMS Caucus in 2017 to foster a stronger connection between the legislative process and the men and women who serve as our first responders in the field. Over fifty legislators have joined the Caucus to date. It was important to host this advocacy day for fire service professionals today to stress the importance of supporting the funding for the indispensable public safety services they provide. 70 percent of these fire service departments are volunteers, if we are not able to fund state sponsored training, and volunteers drop off then the payroll burden will be created and will shift to the municipalities which may not be a viable option for small towns. We must continue our support and keep Fire and EMS agencies as a priority as they are the men and woman who get things done. We discussed concerns and support for important pending legislation and funding issues that directly affect the operations of Fire Service in the State of Connecticut. The day’s event included displays showing various pieces of firefighting equipment and apparatus and the introduction of Fire Chief’s in the House of Representatives Chamber.